Last year’s Con. All original packaging. As summer begins to wind down and students begin to fill the classrooms fear not, there is something to look forward to: the third annual Eau Claire Comic Con. So grab your favorite illustrated characters and go meet up with like-minded people about all things comics. On Saturday, Sept. 7, from 10am to 5pm join in on the fun yourself at the Metropolis Resort. 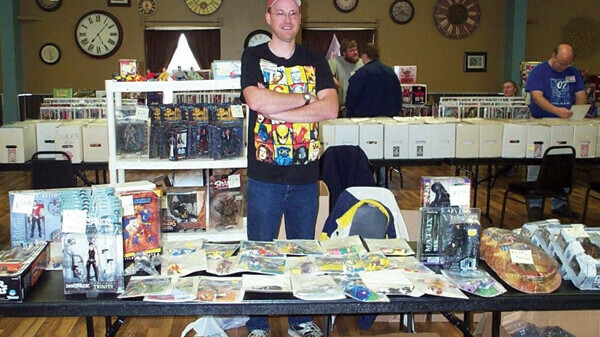 The Eau Claire Comic Con will cater to fans of all varieties of comic-related swag, including toys, monster models, collectables and, of course, the books themselves. The whole day is packed with guest artists and comic creators including Steve Kurth, artist for comics such as X-Men and Iron Man, Christopher Jones, who has worked with Marvel and DC, sculptor Tim Bruckner, and Mark Lone, as well as a plethora of creators from ANA Comics, an independent comic studio that began in 2009. With almost 20 guests and an additional 18 vendors, all of the table space has been booked for an exciting day. Admission is only $5 for everyone 13 and older while those 12 and younger can come for free. For more info, search for “Eau Claire Comic Con” on Facebook.